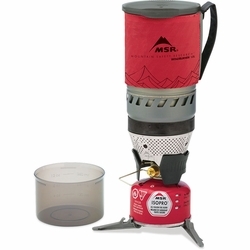 MSR WindBurner Stove System. Combining award-winning Reactor® technology with the features travelers need most, the WindBurner Stove System is ideal for backcountry adventures and weekend camping alike. Its radiant burner and enclosed, windproof design allow the stove to boil water fast and operate in weather that leaves conventional burners in the cold. Compact Design: Conveniently packs the stove burner, 4 oz. (110g) IsoPro™ fuel canister (sold separately), folding canister stand, and PackTowl® inside the pot. Extra full-sized bowl snaps onto the outside. Modular Versatility: Customizable system works with optional cookware accessories, including the WindBurner 1.0L or 1.8L accessory pots, hanging kit and coffee press.